H16DOR-Xiamen Haiwell Technology Co., Ltd.
Xiamen Haiwell Technology Co., Ltd. 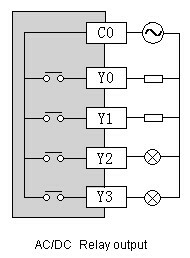 The 16 DO(relay outputs) can be used as the extension module for any types of PLC host;With the RS485 communication, it can also be used as remote IO; When a extension module hanging at the back of the host through the parallel bus, it can be powered by the inner 24VDC on the host; It must be powered by external 24VDC when capacity of the inner 24VDC supply is insufficient; When the module was used as remote I/O through serial bus, it must be powered by external 24VDC supply. 00H (Read only) The low byte is the module code, and the high byte is the module version number. © 2005 Xiamen Haiwell Technology Co., Ltd. All Rights Reserved.